Can we also have special section called 'Axwell Forum Podcast'? Last edited by Hardsoul on 19 Aug 2014, 12:20, edited 4 times in total. Not a bug, but if the chat box could be bigger i would be sooo happy. Because right now you can only see like 3 messages. So i would say either do the box bigger or downsize those grey squares. Last edited by hedz on 18 Aug 2014, 22:33, edited 1 time in total. > Choose two members for forum moderators. We seriously need them. > Change the color of the Submit button on shoutbox. I think it's too bright. Perhaps bright grey would work with the color scheme and make it good looking. > Add a new section for the Axwell Forum Podcast. > Close shoutbox for guests. Last edited by hedz on 18 Aug 2014, 20:30, edited 1 time in total. The bbcode boxes are to small or text is to big. I feel also the boxes and text and attachments in posting mode are just floating next to the other box. I'de think with this new style design its purposed to be more aligned to each other. When you press in the UCP not on a link but on the background in the same box/div as the link. U will get directed to http://axwell.com/forum/undefined. and get a 404 error. Its missing lots of images. Fix those images of unread read thread. Dont think its supposed to look like this, Atleast more aligned or the same buttons. Normally its suppose to show here the online registered users. Although its already shown sort of in the chat. Remove it or fix it. Not really a bug but i think the messageboxes in the chat are to big, or atleast not good useable in peak times! When the chat gets tens of messages in seconds, 3 message dispay wont be enough to keep up the speed i'de think. Or atleast have a fullscreen option! edit: also fix the chatname in chat, getting out of boundry. I just had another idea for the shoutbox/live chat. What about adding filters? That way you wouldn't block guests from chatting with us, but if these annoying spammers come back we can filter them. If you're on 'All' tab, you can see everything, if you're on 'Members' tab you can only see members' messages and on 'Guests' tab you can only see guest messages. This would be a better idea, because sometimes there are good guests that want to participate. And also a 'Block' option is something you could also think about it, because sometimes spammers register simply to spam the livechat, so if we could block/ignore their messages that would be great too. 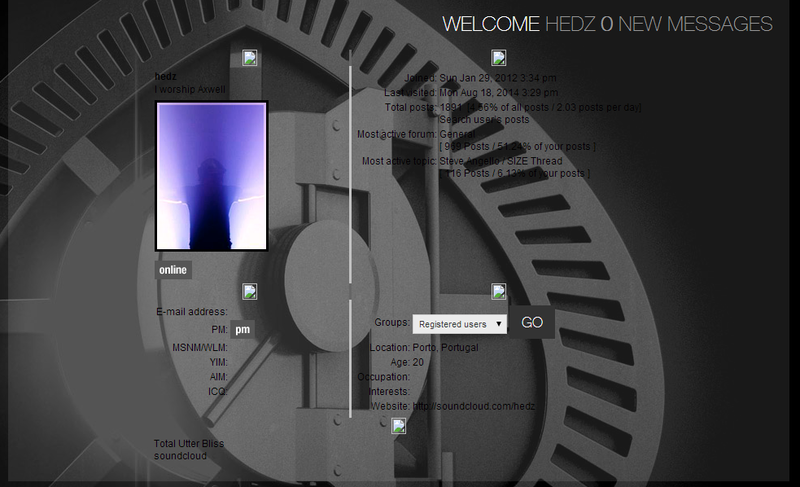 hedz wrote: I just had another idea for the shoutbox/live chat. Now for me guests didn't had to be completely excluded either. So it could have been left the way it was but with active mods, every guest getting a unique number and that they can be banned. Don't know if it's worth the hassle. In the beginning when forum was down, didn't someone of us tweet to amy to remove guests from chat? I think the majority (silently) agreed with that so it would be a bit weird to change that now when they are finally done. About those things like that you can't clearly read black letters on grey background, alignement, etc... I'm wondering why they needed 4 testers. That should have been discussed and fixed in the progress of making it. Not AFTER it's online. registration is open. theres no need to have guests here. It is easy to create an account. as a registered user, if you share an illegal link, youll be banned and the mods can watch your IP, to ban the user again in case you registers again. what annoys me everytime i visit here is the size os the buttons... too big. the chat font size is way out of proportion... users list also. make buttons smaller please. ggssmm wrote: registration is open. theres no need to have guests here. It is easy to create an account.